The Management of the University has put in place an Online mechanism that will avail Students and their parents a direct access to all the Semesters results. The ”Easy Does It” electronic device is code named, “Student Exam Result Checking Solution (SERES) and it is the brainchild of the University’s Information and Communication Technology Resource Centre (ICTREC). Members of the University Governing Council, the Vice-Chancellor, other Principal Officers, Deans and Directors watched the online device through a power-point presentation at the Senate Chamber on Monday. Explaining the mode of operation, Dr. Oguntoye said, once a student or a parent clicks on a particular button (the identity of which will be formally revealed to users through the media soon), the examination results being requested will be fully displayed, within a twinkle of an eye. True to Dr. Oguntoye’s explanation, the experiment done on the floor of Senate Chamber proved accordingly. Commenting on the Online Service, the Vice-Chancellor, Professor Oluwafemi Olaiya Balogun, who expressed joy over the innovation said with it, no suspended or rusticated student will be able to cajole his or her parent that he or she still remains a bonafide student of the University. According to him, this is simply so because parents now have direct access to the results of their wards. Besides, Prof. Balogun also pointed out that the Online Service will boost the Management financial re-engineering and prudence as there won’t be need to expend fortune on the advertisement of the list of erring students, who have been asked to withdraw, expelled or rusticated on the page of some selected national dailies. 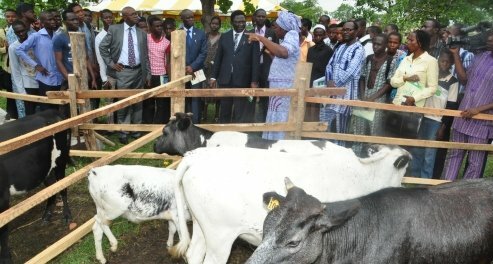 Corroborating Professor Balogun, the duo of members of Governing Council, Mrs. CaroObioha and Chief Lajuwomi as well as the Dean of Students Affairs, Prof. Sam Oluwalana, his College of Natural Science (COLNAS) counterpart, Prof. Tope Popoola and the Dean Elect of College of Animal Science and Livestock Production (COLANIM), Prof Christian Ikeobi, among others commended the Online Service, which they described as a welcome development. However, the Council members, the Vice-Chancellors and other top staffers of the University agreed that a slight modification should be done on the operations of the online service, in order to tighten loose ends.